Students meet like any adult book group. Students select the books, take turns leading the group, monitor their own work, and revise their deadlines and expectations. Age doesn't determine when students are ready. Book clubs can start as soon as students can read thought-provoking texts. At the discretion of the teacher, only one book club may be functioning or 5 clubs may be operating at one time. Book Clubs (or Literature Circles) are built around the questions students ask about books/articles. The question is the student’s ticket to literate conversation. This is exciting news! Coming to the table with a question is do-able. Anybody can ask a question. Clubs are safe places to figure out what one doesn’t understand. The paradigm shift is monumental. In Book Clubs, readers are not expected to know. They’re expected to wonder. In the beginning students may be reluctant to admit what they don’t know. So the first, difficult task is to convince readers that school is a good place to ask questions. To demonstrate, teachers ask questions to show that they don't know everything about books either. Teachers assure readers; bringing questions is proof that they're thinking about the text! When reading taps into what students want - to talk about in school - it becomes an enjoyable social activity. They chat with their friends to straighten out misconceptions. Student-led clubs and discussing relevant issues builds community and comprehension. As a result, students enjoy reading. I can select an appropriate book. I can talk with my classmates respectfully. I can work in a group as an effective team member without a teacher present. I can read for sustained periods of time. I can set goals for my reading work, assess them, and reset them. I can follow a schedule and meet a deadline. I can reflect on my work and set goals for better work. The decisions teachers make about grouping is based on data, including teacher observations. A few students may need to fall in love with reading. In that case, a book 1-2 years below their instructional level would be a good choice. The teacher might want to teach students how to read a challenging book. For them, selecting books 1-2 years above their instructional level is just right. Or, readers of differing abilities might ask to explore a topic together. To do that, making sure books are available on tape so that students can keep up with one another - some by reading and some by listening - is a must. There are also sites where teachers can download podcasts of books and plays like learnoutloud.com. Providing choice will positively affect motivation. To involve students, select 4 or 5 texts ahead of time. Next, help students peek into each book by sharing an engaging summary. Give students time to browse like they would in a bookstore or library: study the cover, read the summary, flip through the pages, and read the beginning to see if the book is a good fit. Ask each student to write 3 choices in numbered order on a piece of paper. Decide which students will work with one another by the choices they make. Keep track of who gets first choice to make sure everyone comes in first as often as possible. The teacher shares a deadline - 2-3 weeks out. The group decides to read in school and/or at home. They create a timeline, the number of pages or chapters to be read each day so as to be finished with the assignments on time. They adjust the timeline during the unit if they’re ahead or behind schedule. Students determine consequences ahead of time (see Problem Jar). For example, if a student hasn’t read the pages assigned by her classmates on book-discussion day, she could read instead of participate to get caught up. If a member hasn’t read because he was absent, classmates might quickly summarize to catch him up. If a student comes unprepared 3 times, classmates may decide that the students can't participate in book clubs, but must complete the assignments alone. If all students need more structure, they could follow the First Discussion Steps until they’re ready to be independent. Readers don't meet every day. If students meet too many times, they don’t have much to say. Groups might meet with the teacher one time per week. Struggling readers might need more meetings with the teacher. Besides meeting with the teacher, students: (1) read 30 minutes or more 2-3 times per week; (2) prepare for discussion by taking notes in notebooks; (3) meet independently with their groups 1 time per week; and (4) complete other assignments like writing, vocabulary, spelling, and research. Students meet before reading. During 1 or 2 initial meetings, the teacher shares what skills and strategies the students will learn and how they will be assessed. Through rubrics, contracts, assignment sheets, and/or learning targets, teachers communicate expectations to the group. Students might take even more responsibility for their work if asked to create assessments to evaluate the clubs. In addition, during the first meeting students and teacher overview the book, set the purpose for reading, and set up reading notebooks to accomplish the teacher’s goals. Teachers may also want to review the argue-safely rules established earlier in the year. Also, students record personal reading goals. Before reading, students reflect on what they want to accomplish during the reading unit and why. It may be to improve participation: I will say something every time we meet. It may be to get better grades: I will stick to the schedule and have my work ready on time. It may to read more fluently: I will try to read in phrases rather than looking at each word. Through modeling or in conferences, students choose one goal they can assess. After the initial meeting, teachers check in periodically to see how members are managing. 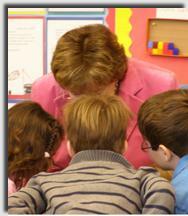 To eliminate deficiencies noted by observing, teachers teach minilessons to the whole class or a small group. Teachers push book club members to (1) make sure everyone gets a chance to talk, (2) encourage one another, (3) reference the text, (4) cite evidence to support their theories, and (5) discuss literal and inferential interpretations of texts. Teachers also assess whether students can analyze and evaluate the texts and author’s craft. When teachers participate in groups, they teach. For example, the teacher may need to stimulate conversations with higher-level questions than the participants thought of for group discussion. They monitor progress by judging whether participants understand the texts or checking whether notebook entries are done. Teachers facilitate by reminding members of learning targets, assignment deadlines, and mediating conflicts. First, group members must ask literal questions. Then, when readers feel comfortable, they discuss inferences. In other words, once readers are clear about plot, characters, settings, and vocabulary, they can and will discuss author's purpose, main ideas, themes, and author's craft. When finished, they reflect on whether the book will change the way they feel or will act. Students write a reflection at the end of almost every reading or discussion session. They explain what they learned and ask questions left unanswered - even after meeting with their reading group. Teachers create lessons to address what they learn from reading the reflections. If readers think they don’t have any questions, they still have work to do. They look for literary elements to share with their bookmates: foreshadowing clues, metaphors and similes, personification, clues to the author's purpose and theme, characterization, and author's craft. If modeled, students will ask questions like: I noticed that the mom has a slight cough. Do you think the author wrote that as a clue that the mom might get really sick later in the story? Did anyone else notice that? Eventually, students come to their book clubs expecting to talk about what they don't understand and what they noticed. They prepare for discussion by marking confusing places with sticky notes or keeping track in their notebook. These notes are a wonderful jumping off place for discussion. As readers relax, they discover that finding good books and talking about them is great fun! They look forward to clearing up confusion and posing theories about texts with their friends. The question-posing, evidence-seeking practice of Book Clubs prepares students for any task, including tests. Be proactive in heading off problems before they start with these activities. 8 steps to successful discussion. Sentence stems students use to talk with one another about difficult subjects. Students learn from one another when they share inferences they have drawn. ..studies have found that time spent reading in school and the opportunity to self-select reading materials promotes increased positive feelings about reading and improved achievement...Other studies of sustained reading with student self-selection have documented the additional positive effects of teacher modeling, providing opportunities for students to share their reading with their teacher or with peers, and keeping response requirements to a minimum..."
"The Precarious Place of Self-Selected Reading," Worthy, Turner and Moorman, Language Arts, Volume 75, No.4, 1998.